For weeks now, Yury Luzhkov has been receiving ultimatums to resign, along with black valentines for his wife. Yesterday, he did a Metaxas. Ioannis Metaxas, a career army officer with more military skill than brains, ran Greece as a dictator from 1936 until his death in January of 1941. He was fascist, meretricious, cruel, and his regime was corrupt. But for one thing he will always be remembered by the Greeks – his honour when it was tested on October 28, 1940. At 4 that morning, Metaxas was summoned from his bed by the Italian Ambassador, Emanuele Grazzi, who delivered an ultimatum from Italy’s dictator, Benito Mussolini. Metaxas was told to allow the Italian Army to cross from Albania, and occupy a selection of strategic locations, or else face war. Metaxas replied with one word – Οχι. That word, and Metaxas’s saying of it, have become a national holiday in Greece. The Greek Army went on to thrash the Italian invaders, and drive them from their own occupation of Albania. Although the Italian forces had superiority in the air and in artillery, on the ground they underestimated the Greek numbers and their defences. Metaxas’s Οχι turned into Greece’s victory over Italy, which had to be rescued by the Germans. The honour of saying no is not less great if the outcome is defeat. Luzhkov wasn’t saying that the coalition of forces around President Dmitry Medvedev, who have been behind the ouster measures, will not prove stronger than he is. “I am not going to resign of my own accord,” was the way the mayor put the position. This is the most public challenge ever issued to Medvedev. 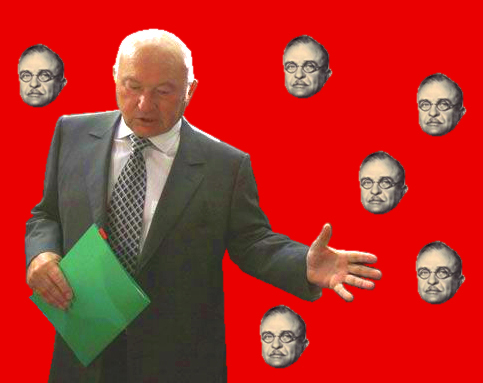 Luzhkov is daring Medvedev to prove his strength – and to risk the judgement of pusillanimity if he can’t. Candidates for the Russian presidency cannot win if they don’t carry Moscow – and for the moment, Luzhkov is declaring that Medvedev cannot. That’s the raw power calculation. But there is something else to this. Since the death of Marshal Sergei Akhromeyev, there has been no honour in Russian politics. Apparatchiki make their markov with threats they are afraid to put their names to. Whatever the charges against Luzhkov, true or false, everyone understands that he is not more culpable than his accusers. But by saying no, and saying it now, he is doing what Akhromeyev could not – putting the gun in his principal accuser’s hand, and challenging him to fire. Medvedev’s calculation is that it is better that Luzhkov should be dead today, allowing enough time for a successor to establish himself before the presidential poll comes closer. So he has taken his shot. “Alors, c’est la guerre”, Metaxas told Mussolini’s messenger as he went out the door. Let’s see how that turns out.